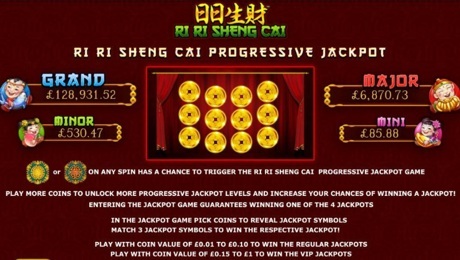 Ri Ri Sheng Cai is a 5 reel, 243 ways to win video slot game with 4 progressive jackpots and up to 18 free spin games with up to x18 multiplier! 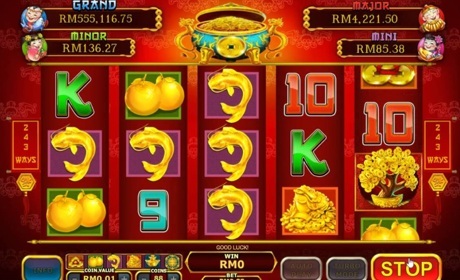 This Chinese themed slot has all your favorite gold symbols like frogs, plates, coins, koi fish, bansai and more! This slot is played using 1 of 6 coin levels - they are 8, 18, 38, 68, 78 or 88 coins. The higher the levels you play, the larger the number of gold symbols on the reels and the bigger the prizes and progressive jackpots available. If you play with 0.01 - 0.10 coins you can win regular jackpots; betting with coin value of 0.15 or more will allow you to win VIP Jackpots. Two special bonus symbols (see image below) can trigger the Progressive jackpot bonus feature. Once triggered, pick from the selection of golden coins. Land 3 of the same jackpot symbol and that’s the prize you’ll win. There are 4 in all: mini, minor, major and grand and you’re guaranteed to win at least 1 of them. The more coins you play with, the better the chances of triggering the progressive. Plus, if you bet with coin value of at least 0.15, you can unlock VIP Jackpots. Note: In order to get the best odds, always bet max 88 coins per spin and choose the corresponding coin size to qualify for the corresponding jackpot: if the regular Grand jackpot is bigger then the VIP Grand pot, you may want to choose coin size of 0.10 or less.